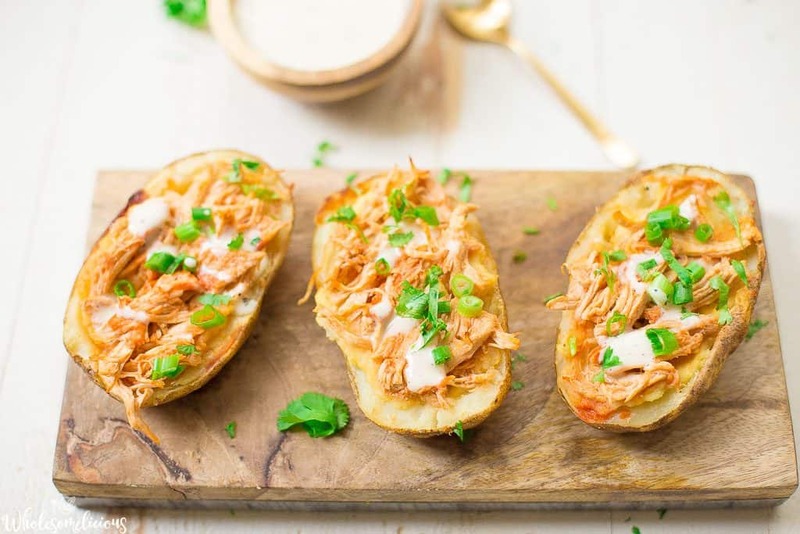 Whether it’s game day, entertaining, or just for a hearty and healthy tasty meal, these Buffalo Chicken Potato Skins are sure to please everyone!! 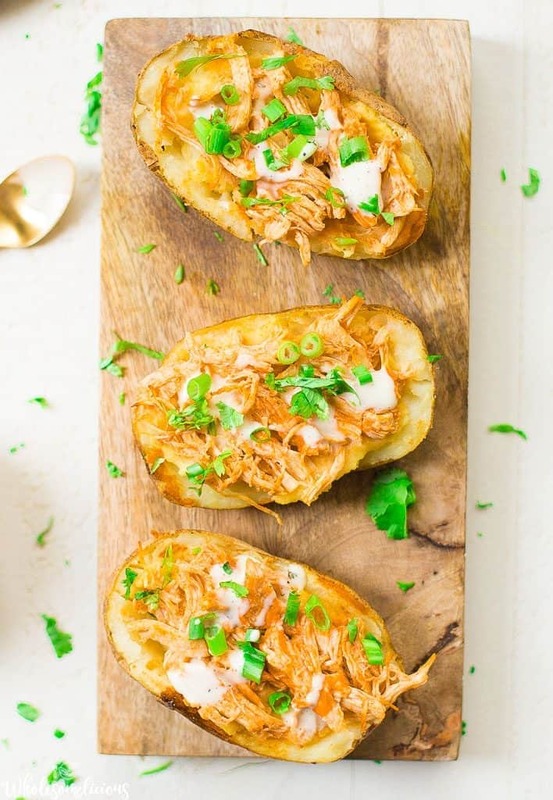 Crispy potato skins are baked with shredded buffalo chicken, and topped with all of your favorite goodies. 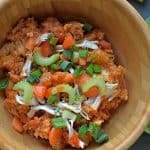 Recipe is dairy-free, Paleo, and even Whole30 friendly. I might not be the biggest football fan, but I am for sure one of the biggest buffalo chicken fans!! And full disclosure, this does not include wings. I want all the buffalo chicken….. without the wings. So my friends. 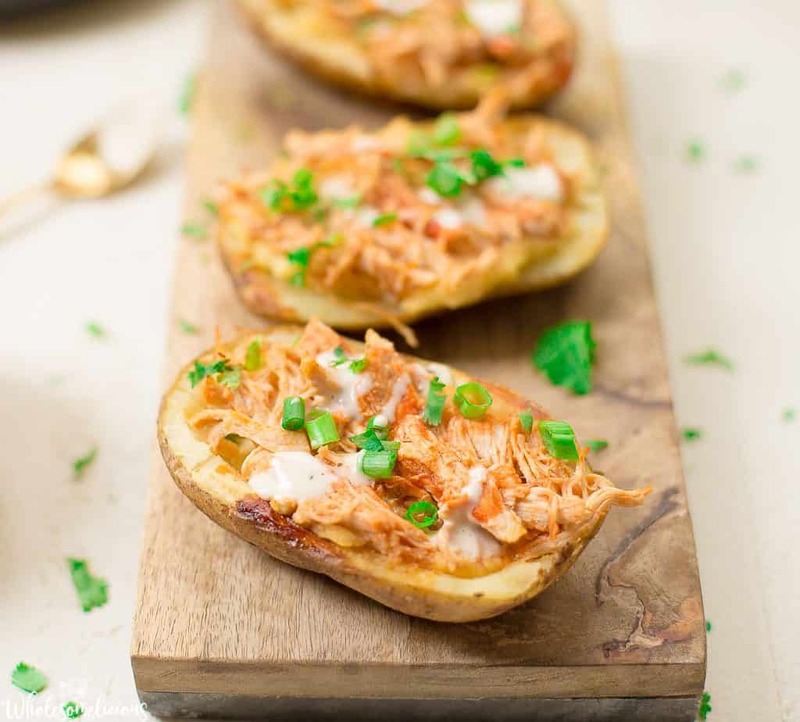 I bring you yet another buffalo chicken recipe to add to our repertoire: Buffalo Chicken Potato Skins!! You’ll love this variation for a perfect appetizer, or even weeknight meal. It’s almost GAME DAY!!! In my world, this means, “it’s almost stuff your face with yummy appetizers day”. Who else is with me? Don’t get me wrong, I do love a good football game sometimes, but most of the time, I just enjoy a really good spread. And football food must definitely include Buffalo Chicken something. Or buffalo chicken everything. 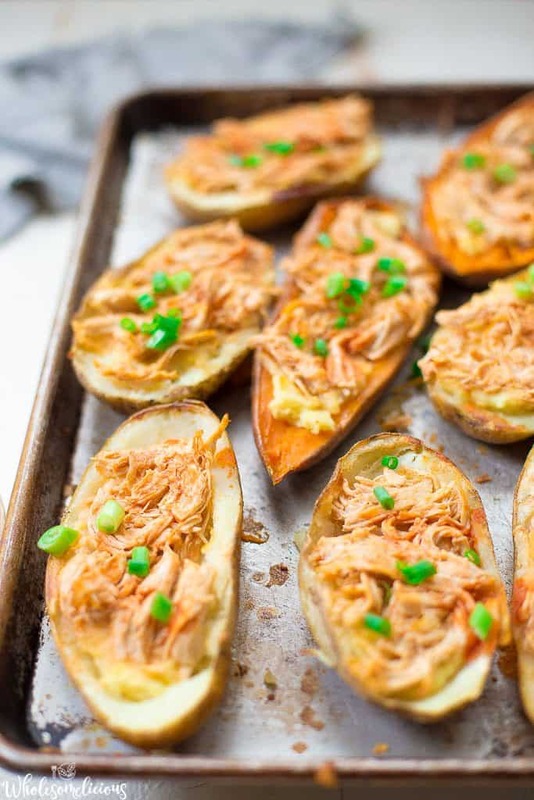 So these have all the same delicious taste of a potato skin, but are made with lightened up healthier ingredients to keep them Paleo and Whole30 friendly. I’ve also made them more of a twice baked potato by mashing up the potatoes and creating a delicious “cheesy” flavor in the middle. Notice there are a few sweet potatoes thrown in the mix? You can use a combo of both regular and sweet potatoes, or pick the one you like better. Either potato will work! I’ve also included a few different ways to make your buffalo chicken. For a shortcut, you can use a rotisserie chicken and add just a 1/2 cup of buffalo sauce. 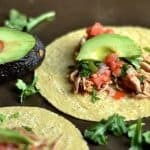 Otherwise, I’ve given you a quick way to make perfect shredded chicken with the instant pot. For goodies on top, you’ll love this homemade Paleo Ranch from the Real Food Dietitians. Preheat your oven to 400 degrees F. Begin by washing your potatoes, dry and pierce each potato a few times with a fork. Bake until tender, approximately 1 hour. While potatoes are cooking, prepare your chicken. If using a rotisserie chicken, shred approximately 2 cups and mix in 1/3-1/2 cups of buffalo hot sauce (depending on your preferred level of spice). If using raw chicken, prepare in your instant pot. 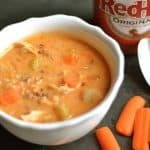 Place chicken breast, buffalo sauce, and chicken broth in your pot. Secure the lid, make sure the valve is sealed. Select manual, and adjust to 10 minutes. Once finished, use a quick release. 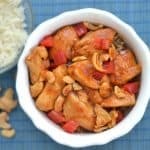 Shred chicken with a fork or knife, and be sure to mix in the sauce (you won't use all of it). Set aside. Remove your potatoes from the oven and let cool for about 10 minutes. Slice in half. Now scoop out the flesh (leaving about 1/8 inch rim around the potatoes), and transfer the inside of the potatoes to a bowl. Brush each of the skins with oil, and place back into the oven (skin up) for another 15 minutes. While skins are roasting, mash the potatoes. add coconut milk, dijon mustard, garlic, nutritional yeast, and salt. You can also use a hand mixer to give the potatoes a "fluffy" texture, adding more coconut milk if needed. Remove the skins from the oven, and fill with approximately 2 tbsp of mashed potatoes. Top with a few tbsp chicken and green onion. Place back in the oven for another 10 minutes. Remove and top with cilantro and ranch dressing (if using). Serve hot! *You can use rotisserie chicken in place of making the chicken breast in the instant pot. You will need approximately 2 cups of shredded chicken. Sounds like a great pleaser for us! Thanks for the wonderful recipe!